Bryce Harper was hit on his right ankle by a pitch in the bottom of the sixth inning and left the game early. 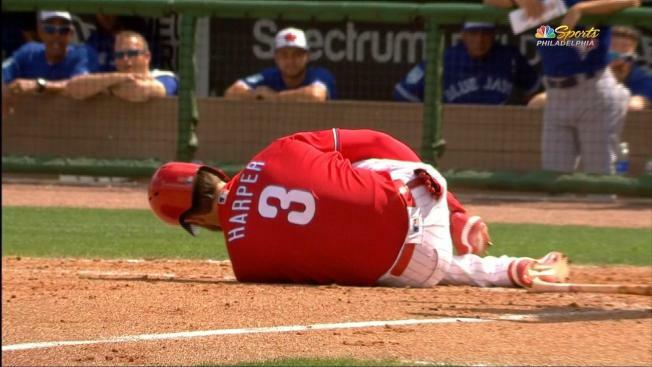 Bryce Harper left the Phillies' Grapefruit League game against the Blue Jays on Friday afternoon in Clearwater, Florida, walking gingerly off the field after getting hit with a pitch on the right foot. After the Phillies' 3-2 win, manager Gabe Kapler told reporters in Clearwater that Harper has a right foot contusion. "It was certainly extra scary given where we are in camp, but we're confident," Kapler said. "We understand that we have a good club on the field. And we're confident Bryce is going to be alright." In the bottom of the sixth inning, Harper was struck on the foot on a 1-1 pitch by Trent Thornton, a 96 mph fastball. Kapler immediately came out to check on Harper, who shouted a few words at Thornton after rising to his feet, presumably in frustration. Thornton said the pitch slipped and that he was "amped up" to face Harper, per Rogers Sportsnet's Arash Madani. Blue Jays reliever Trent Thornton, who hit Bryce Harper on the top of the foot with a pitch, is getting crushed on social media and being threatened by "fans." Thornton tried to go inside on a 1-1 pitch with a fastball, and "it slipped," he said. Thornton after hitting Harper: "I was amped up. It was the first time I've ever faced him. I wanted my stuff to be good. I threw a good curveball that he swung through. I was trying to set that up -- go inside, and like I said, unfortunately it got away from me." Harper was 0 for 2 with a strikeout on the afternoon before the hit by pitch. He left the dugout later in the inning and walked to the clubhouse, accompanied by a Phillies trainer. Harper is now 0 for 5 with three walks and two strikeouts in spring training play. He's said he typically needs 40 to 50 plate appearances to feel ready for the regular season. With opening day on March 28, he might not end up getting that many plate appearances, although health will obviously be priority No. 1. "I think it's a little premature to speculate on lost at-bats or anything like that," Kapler said. "I think, first and foremost, we probably have to get inside and meet with our medical team and discuss. But, again, not overly concerned right now." The Phillies had planned for Harper to play right field on Saturday vs. the Astros and to DH on Sunday vs. the Yankees. You'd assume that plan might change, as the Phillies have every reason to exercise caution with the star they've signed to a 13-year, $330 million deal with a no-trade clause and no opt-outs.